Ethiopian marathon runner Feyisa Lilesa has not returned to his home country since making anti-government demonstrations after he won a silver medal at the 2016 Summer Olympics in Rio de Janeiro, ABC News has learned. (RIO DE JANEIRO) — Ethiopian marathon runner Feyisa Lilesa has not returned to his home country since making anti-government demonstrations after he won a silver medal at the 2016 Summer Olympics in Rio de Janeiro, ABC News has learned. Lilesa’s agent Federico Rosa confirmed to ABC News Wednesday that the runner did not fly home to Ethiopia with the country’s Olympics team Monday. 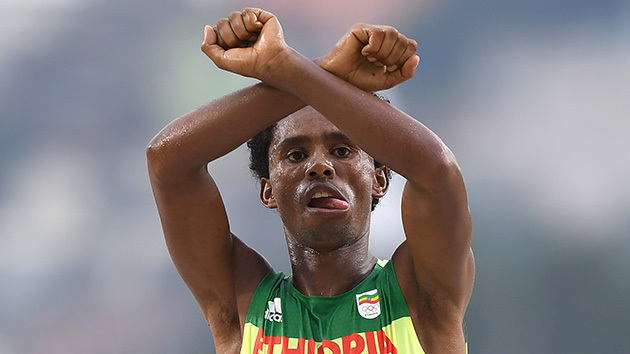 As Lilesa crossed the finish line in second place in the men’s marathon race Sunday, he lifted his arms above his head and crossed his wrists to make an “X.” The 26-year-old made the gesture again on the podium and later explained he was protesting against the killings of the Oromo people in his home country. Lilesa, whose whereabouts could not be confirmed by ABC News, then warned that he could be thrown in jail or killed if he stepped on Ethiopian soil after making that gesture. A GoFundMe page set up to support Lelisa’s bid for asylum has raised over $123,000 so far. Lelisa’s agent did not confirm whether the runner was seeking asylum. The daring gesture that Lelisa made in Rio is the same one people have made for months in protests across the Oromia region, home to Ethiopia’s largest ethnic group, the Oromo. Anti-government protests have rocked Oromia since November. The demonstrators and opposition members were initially protesting against the Ethiopian government’s plan to integrate infrastructure development and expand the municipal boundary of the capital, Addis Ababa, into surrounding towns in Oromia. Some feared the urban expansion would cause Oromo farmers to lose their traditional lands. The largely peaceful protesters were met by federal security forces that have allegedly used excessive and lethal force to quell the demonstrations. More than 400 people are estimated to have been killed, thousands injured and tens of thousands arrested since November 2015, according to a report by Human Rights Watch based on over 125 interviews with witnesses, victims and government officials. The Ethiopian government canceled the proposed Addis Ababa Integrated Development Master Plan in mid-January. But activists and researchers said that hasn’t stemmed demonstrations or the alleged crackdown in Oromia as protester grievances have swelled because of the government response. Earlier this month, the United Nations urged the Ethiopian government to allow for international observers to conduct independent and transparent probes into the allegations. Ravina Shamdasani, a spokeswoman for the Office of the U.N. High Commissioner for Human Rights, said it’s critical for human rights experts to have access to areas where there are reports of ongoing arbitrary arrests, intimidation and harassment. “We call on the government to ensure that the rights to freedom of peaceful assembly and expression are protected and that those detained for exercising these rights are promptly released,” Shamdasani told reporters at a news conference in Geneva. As for Lelisa, Ethiopia’s Communications Minister Getachew Reda recently told CNN that Feyisa Lilesa “is entitled to make” a “political statement.” Reda called the marathon runner “an Ethiopian hero” and said he “shouldn’t at all be worried” to return home. “I can assure you nothing is going to happen to his family nothing is going to happen to him,” the minister told CNN this week. The Federal Government Communication Affairs Office of Ethiopia did not immediately respond to ABC News’ request for comment.